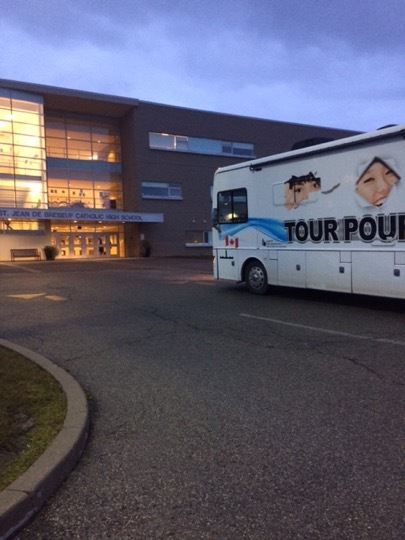 Tour for Humanity spent the past 2 days at a Catholic secondary school in Woodbridge for a series of Global Perspectives workshops. Friends of Simon Wiesenthal Center (FSWC) Educator Daniella worked with Grade 11 Religion classes, most of whom are currently studying a unit on Judaism. Daniella took the classes through our Global Perspectives workshop, beginning with an overview of the definition of “genocide” and then leading students through the 10 Stages of Genocide, using the Holocaust as a primary example. The school’s principal sat in on part of the last workshop so Daniella went to speak with her at the end of the day. She thanked FSWC and the Tour for Humanity for coming and expressed how important it was for students to hear the messaging.